During the trailer launch of Kalank, Sanjay Dutt and Madhuri Dixit were seen addressing each other as 'Sir' and 'Ma'am'. The unusual exchange of greeting between the two had amused the film's lead actor Varun Dhawan a lot. Madhuri Dixit and Sanjay Dutt's alleged affair has always been the talk of the town and it was being said that the two were about to get married before their break-up. The two had done many films together in the 90s and their on-screen chemistry was something that moviegoers used to crave for. After almost two decades, Madhuri and Dutt will be seen sharing space in Karan Johar's period drama Kalank and there's no doubt that the excitement level of their fans is sky high. Things have changed a lot but their mutual admiration for each other has not even a bit. But what's even more exciting about the former lovebirds is, the way they talk to each other today when their past and present crossesover. During the trailer launch of Kalank, Sanjay Dutt and Madhuri Dixit were seen addressing each other as 'Sir' and 'Ma'am'. The unusual exchange of greeting between the two had amused the film's lead actor Varun Dhawan a lot and was even seen making fun of it. And since Madhuri and Dutt are cordial with each other, their fans wonder what the two must be talking about now. Revealing the details of their conversation these days, Madhuri told Mumbai Mirror, "We enjoy pulling each other's leg. We both have kids now and discuss their education. It's been great working with him again." Earlier, there were reports that Madhuri had some sort of discussion with the makers of Kalank about sharing scenes with Sanjay Dutt before signing the film. Later, it was reported that there was no awkwardness between the duo while shooting the film despite their controversial past. And now Madhuri has revealed that she didn't even read the script before she signed the film as Karan Johar is a close friend. 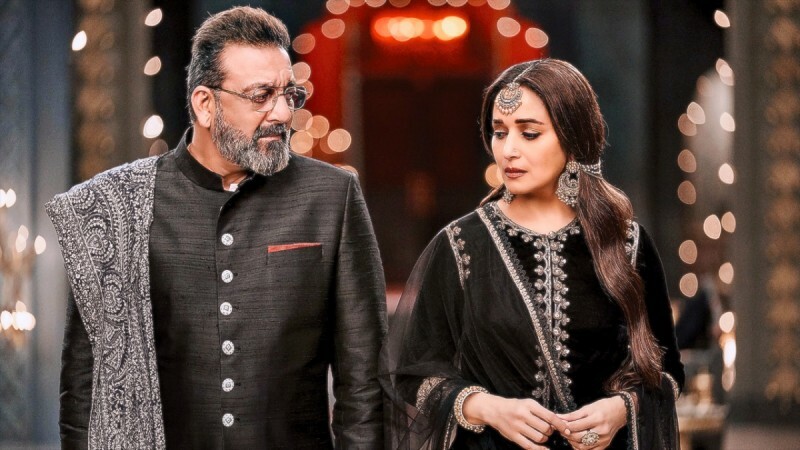 In the film, Sanjay Dutt plays the character of Balraj Chaudhry who is described as "the most powerful voice of the table, the formidable one", while Madhuri Dixit Nene will be seen playing the character of Bahaar, "the true Begum". Her character is further described as "enchanting, ethereal and timeless". Kalank, which also stars Alia Bhatt, Varun Dhawan, Sonakshi Sinha and Aditya Roy Kapur, will hit the theatres on April 17.